Liquid Force El Guapo Wakesurfer 2017. The name says it all... This handsome new mini longboard is all about good looks and style. The full bodied shape and beveled rails allow for smooth effortless rides and the concave hull keeps the board humming along at a nice pace. An adjustable single center fin box lets you adjust the ride... Move it forward for a looser feel or bring it back for a tighter, more driven feel. The Guapo loosens your style and lets your ride becomes more about the flow and less about the go, go, go! Jam a turn off the tail, get in the curl, glide, and hang 5... 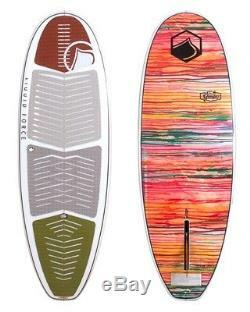 Your summer is guaranteed to be a lot more fun with this unique shape added to your quiver! CNC Milled EPS Foam Core With Wood Stringer. Single To Double Concave Hull With Beveled Rails At Nose w/ Tip Concave. Full EVA Deck Nose To Tail. 2 Layers Of 6 oz Glass On Deck, 1 Layer On Hull. Beautiful Full Color Inlaid Graphic Base. Adjustable Center 6.5 Longboard Style Single Fin. 5 ft 2 in 157.9 cm. 20.3 in 51.5 cm. Nose 6.1 cm Tail 5.3 cm. Up to 220 lbs Up to 100 kg. The item "Liquid Force El Guapo Wakesurfer 2017" is in sale since Thursday, January 05, 2017. This item is in the category "Sporting Goods\Water Sports\Wakeboarding & Waterskiing\Wakeboards". The seller is "88-gear" and is located in Reedsburg, Wisconsin. This item can be shipped to United States.